The statement was made by Ali Hasanov, the Azerbaijani president’s aide for public and political affairs, at a presentation of the book entitled “Discover Azerbaijan: Baku 2015”, published by the British company Senate Publishing. The members of all religions and ethnic groups in Azerbaijan live in peace and prosperity as one family, and they contribute to the country’s successful development, he added. The president’s aide stressed that in the last ten years, Azerbaijan’s economy grew more than three times, unemployment and poverty fell by five percent, social and economic structure were rebuilt, and the welfare of the population improved. He also stressed that the highest standards of European Games have been established in Azerbaijan. Today, Baku, in terms of appearance, had seen its contemporary social and cultural infrastructure reached the level of the most beautiful cities in the world. 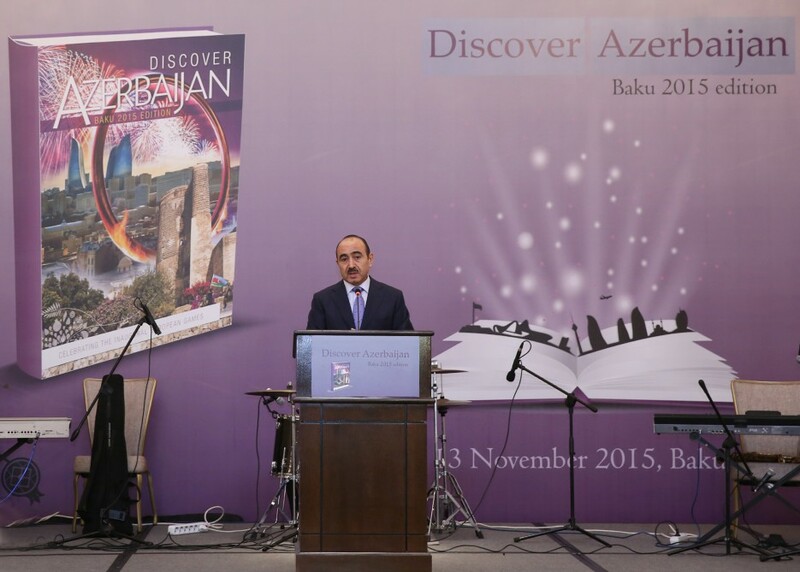 The points reflecting modern development of Azerbaijan were reflected in the book “Discover Azerbaijan: Baku 2015”, he said. The book in English covers not only sport games, but also all areas of modern development of Azerbaijan. He noted that the materials, which are reflected in the book, widely analyze the successful implementation of Azerbaijan’s oil strategy during the years of independence, the value of the implemented important trans-national energy projects in the region’s development and ensuring energy security of both the region and Europe. Addressing the event, Youth and Sport Minister Azad Rahimov stressed that the first European Games were not just a sporting event, but also a unique opportunity to promote Azerbaijan in the world. “The first European Games Baku 2015 have revealed an example of tolerance and cultural traditions of Azerbaijan. At this event we were able to demonstrate the development of our potential, cultural and moral values,” said Rahimov. The minister stressed that the first European Games were a historic event that will be remembered for many years. Interest in Azerbaijan throughout the world increased significantly after the first European Games, he noted. Rahimov recalled that Azerbaijan will host international competitions, including the Chess Olympiad, the Formula 1 race, and the Islamic Solidarity Games. The book was created by Lord David Charles Evans, Member of the British House of Lords. Speaking at the event, he stressed that Azerbaijan and Great Britain have close relations. Lord Evans added that the book shows the many successes Azerbaijan has achieved in all areas. The European Games kicked off in Baku on June 12 and lasted 17 days. It hosted 20 elite sports, 16 of which were Olympics, while 12 were licensed for the Rio 2016 Olympics. Over 6,000 athletes represented European countries at Baku 2015. Azerbaijan ranked second for the number of medals won at Baku 2015, with a total of 56 medals – 21 gold, 15 silver, and 20 bronze medals. Russia took the lead for the number of medals with 79 gold, 40 silver, and 45 bronze medals. The UK ranked third by winning 18 gold, 10 silver, and 19 bronze medals.